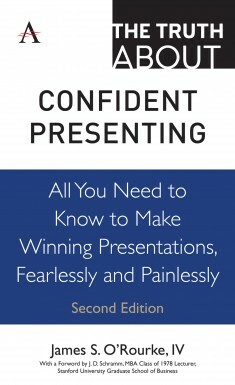 ‘The Truth about Confident Presenting’ is a collection of more than four dozen basic truths about successful, confident public speaking in accessible, brief chapters by a master of the art. Accomplished public speakers know that just a few enduring principles govern the key to success. Based on scientific evidence and years of careful observation of highly successful public speakers, James O’Rourke has gathered 51 basic truths about confident presenting, organized into ten easily mastered categories in ‘The Truth about Confident Presenting’. Current relevant examples and specific instructions on how to apply these truths form the centrepiece of each brief chapter. Everything you need is right here – from audience research to topic selection, organization patterns, forms of evidence, principles of persuasion, delivery techniques, nonverbal mannerisms, anxiety and event management. James S. O’Rourke IV, teaching professor of management and the Arthur F. and Mary J. O’Neil Director of the Eugene D. Fanning Center for Business Communication at the University of Notre Dame, USA, is a widely regarded consultant among ‘Fortune 500’ companies in the United States and around the world.